BEIJING: China plans to operate five aircraft carriers in the near future, including two nuclear-powered ones that would be launched around 2025, according to Chinese military experts. 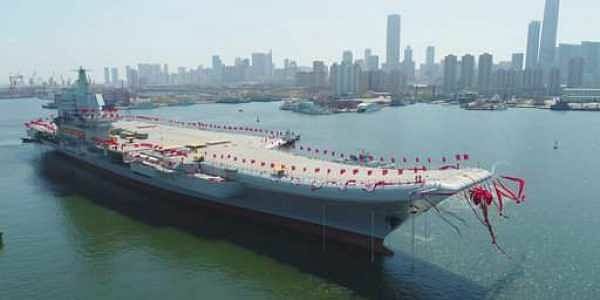 The People's Liberation Army (PLA) Navy will have five aircraft carriers in the near future, country's officials media reported, adding that country's third aircraft carrier is currently being built in Shanghai. China will develop two nuclear-powered carriers, Wang told the daily. Japan recently announced plans to convert 27,000-ton Izumo-class helicopter destroyers into aircraft carriers, sparking concerns in China. They are also vital to global trade. China claims almost all of the South China Sea. Vietnam, the Philippines, Malaysia, Brunei and Taiwan have counterclaims over the area. China is developing Pakistan's deep-water Gwadar port in the Arabian Sea. Early this month, China clinched a deal to build a multi-billion dollar port at the strategically important Kyaukpyu in Myanmar, located in the Bay of Bengal.